In an interview in 1980, Elisabeth Mann Borgese (1918 – 2002) told People magazine that some of her earliest memories were of her dad and the sea. Her father, Thomas Mann, a giant of 20th century literature, would take her and her five siblings from their home in Munich, Germany, to the Baltic, North or Mediterranean Sea. “It was very important to him,” she remembered. Maybe it’s not surprising, then, that the world’s waters became very important to Borgese, too — so much so that by the end of her life, she had earned two monikers for her ocean advocacy: “Mother of the Oceans” and “Ambassador of the Seas.” Nominated for a Nobel Peace Prize and a member of the Order of Canada, she was an internationally recognized expert on maritime law and policy, ocean studies, ocean resource management and the protection of the environment. Borgese wasn’t always so focussed on water, though. “We grew up with a sense of the enormous importance of art, literature and politics,” she told People. Born in Munich, Germany just before the end of the First World War, she studied classics, piano and cello as a young woman. Throughout her life published plays, fiction and non-fiction, including Ascent of Woman (1963), a pioneering feminist work. She also worked at Encyclopaedia Britannica and was a senior fellow at the Center for the Study of Democratic Institutions in California, where she helped frame a World Constitution. She spent the rest of her life articulating that philosophy alongside researchers, legal experts and world leaders, organizing the first Peace in the Oceans conference, establishing the International Ocean Institute (the Canadian office for which is hosted at Dal) and laying the foundation for the United Nations Convention of the Law of the Sea. “We must save our oceans if we are to save ourselves,” she wrote in her 1976 bestseller, The Drama of the Oceans. 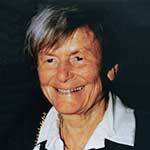 Borgese brought her passion for the ocean to Dalhousie in 1977 at the age of 59, becoming a Senior Killam Fellow. She only expected to stay for a year but became, as she put it, “the guest who stayed forever,” teaching undergraduate and graduate courses in political science for more than two decades. (Her personal archives were also donated to the university.) After retirement, from her home base in a weathered oceanfront A-frame near Sambro, Nova Scotia, she continued to pursue projects related to disarmament, international development, integration of marine resources and marine management.